Potato is 'the' vegetable which is loved by the world. I have never come across a person who hate potato. What is so special in potato? I don't know but it tastes awesome. Though it has more carbohydrate, no one seem to bother. This recipe is a very famous Indian snack. This food can be prepared in 15-20 mts. Who doesn't like food prepared in minutes? and that too with potato. In a Pan, 1tbsp of oil and mustard seeds. When the seed pops add cumin seeds and hing powder. Now add Green chillies, garlic, Ginger and fry them for 30 sec. Add turmeric powder and within few seconds add the chopped onions. Fry the onions till they become light brown in colour and then add salt. Now add the chopped cilantro . Add the mashed potato with this and mix well. When it is mixed properly add the lemon juice and mix. Prepare a paste with Besan (gram flour) and baking soda. Add chilli powder and salt to taste. Mix well with the batter and the consistency of the batter must be a little thick. 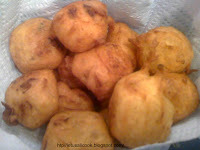 Make small balls from the potato mixture and dip it in this batter. Make sure that this batter covers the ball well and deep fry in Oil. Serve hot with chutney. This food tastes good even without any side dish. Those look very good. A samosa recipe would be great too. They are delicious.